**Note: If you have chlorine in your tap water like Brisbane does leave a jug of water with the top open for a couple of hours for the chlorine gas to evaporate. Chlorine will kill off any micro-organism growth which is what we’re trying to achieve here. Or use purified water. I have a reverse osmosis filter for drinking which makes it easier. I’ll include each method as it was all part of my journey and useful information is never a bad thing. This is how I first started doing it. To make your own EM additive from scratch. 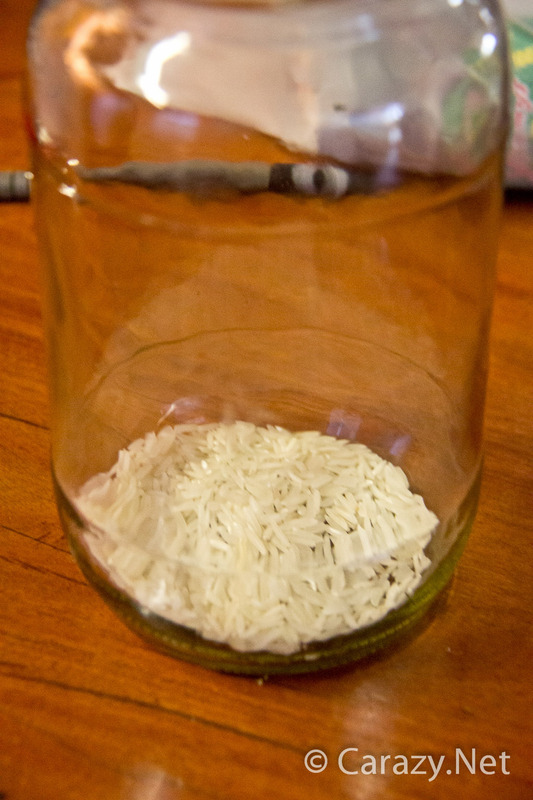 STEP 1 – Mix 1 Tb of raw rice with 1 cup of water. Place a paper napkin over it (Ensuring air can move in and out of it, bringing in natural microbes from the environment) and place in a cool dark spot for a week. 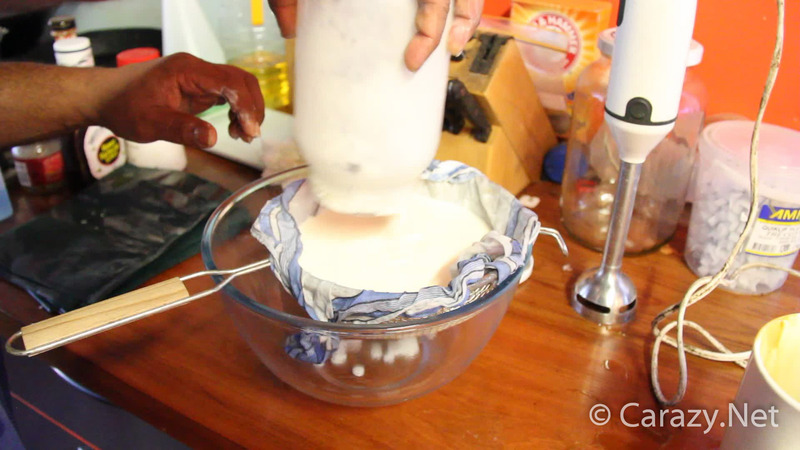 STEP 2 – Add 2 cups of milk (I use 2 tablespoons of milk powder and two cups of water to keep costs down) and keep this in a warm place for a couple of days so the microbes can feed on the milk.. 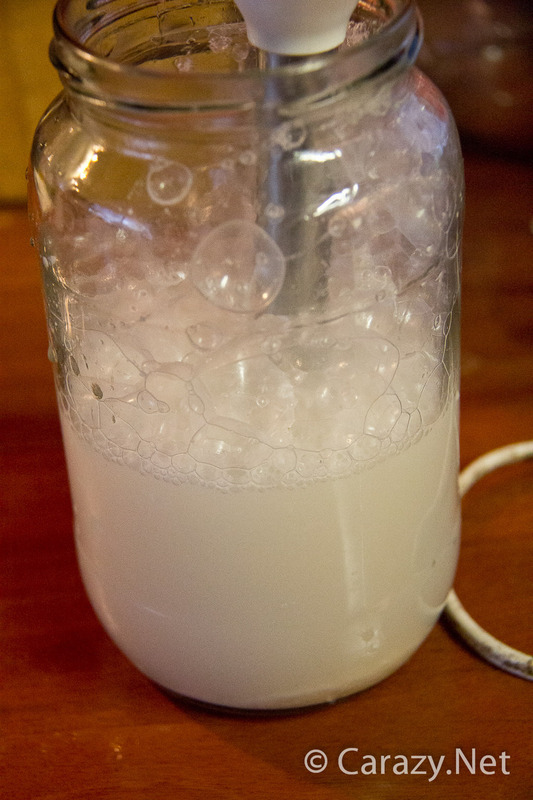 STEP 3 – Strain this liquid through a sieve keeping the watery bit. The thick strained solids can go into your bokashi bin on top of your first layer of scraps. 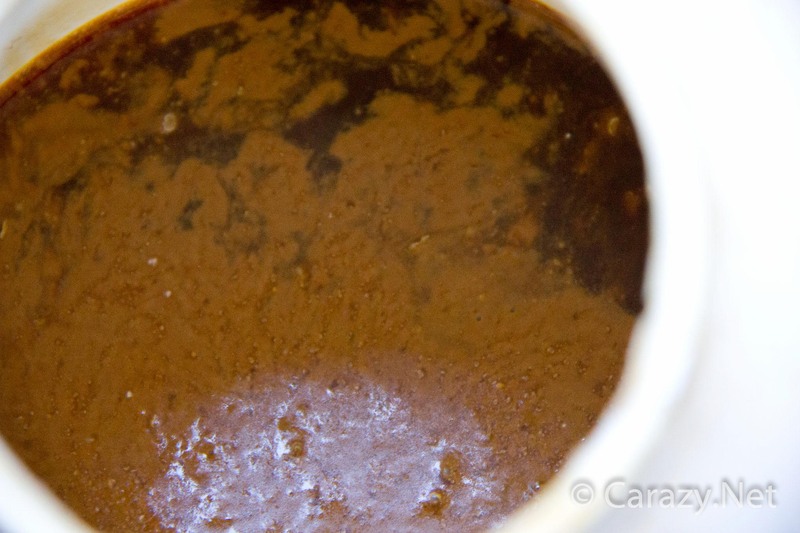 STEP 4 – Add the watery bit (EM serum) to equal parts molasses/ brown sugar and water then store in the fridge to use later. You now have your own EM concentrate so to speak! 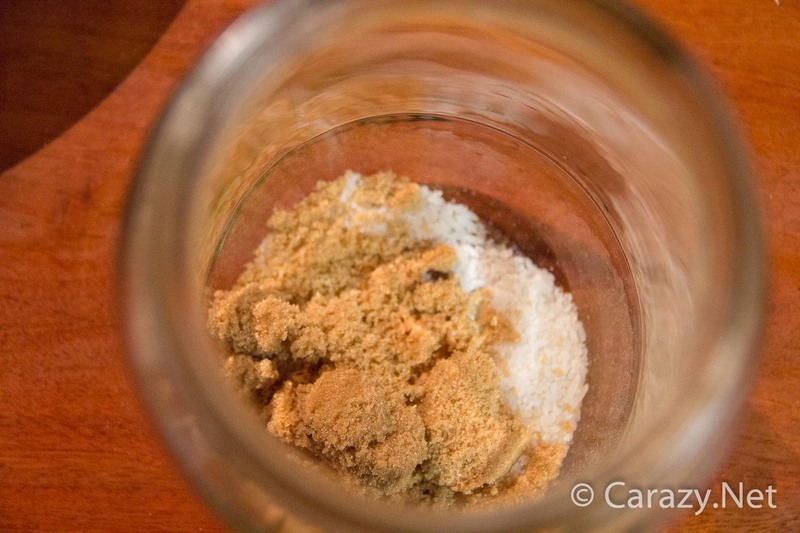 STEP 5 – You can mix it thoroughly with Rice bran or some other coarse unrefined powder until the bran is just moist enough to clump and use that as your EM powder. Do as I did and keep the liquid serum in the fridge. Whenever you needed to add EM to your bin you simply pour/smear a couple of tablespoons of serum onto a doubled sheet of moist newspaper and let it soak in. Place newspaper on top of scraps. Then with each additional ~10cm layer of kitchen waste in the bokashi bin, I’d soak some more newspaper and layer it on top. Repeating as you add more scraps over the weeks. The jar of bokashi serum/ liquid can simply be stored in the fridge with a secure lid. STEP 1 : Skip steps 1 to 3 from above and simply use the whey from natural yoghurt! It’s the watery stuff that sits on top of yoghurt the day after you’ve scooped some out. If you want to extract all of it simply place your natural yoghurt into a sieve/strainer lined with a clean cloth (less absorbent the better Eg. muslin/thin cotton) and catch the whey that trickles out. Congratulations you also just made a free Greek yoghurt cheese recipe! The leftover super thick yoghurt in the strainer is called Labneh (link opens in new window). STEP 2 : Mix whey with molasses / brown sugar and non-chlorinated water (I threw in some rice just for the heck of it too) and let it sit for a week with the lid just loose enough that gas can escape. I’m such a muppet. I bought 20kg of molasses and left the lid on tight, forgetting that the microbes in the air were inside gorging themselves and farting. 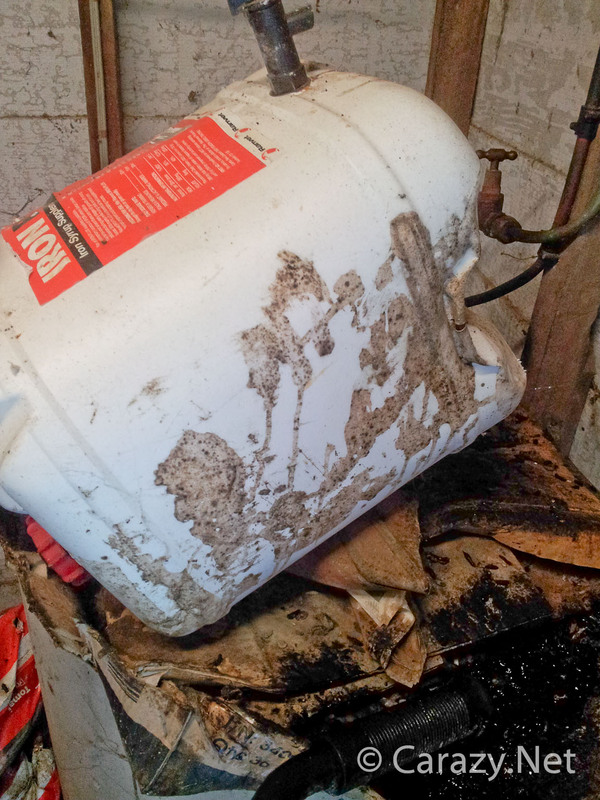 The buildup of gas caused the container to split and spray and drip molasses everywhere. Note to self, always allow for pressure release when storing molasses. 1.5kg protein powder tub I used to mix up the whey mixture and molasses to allow the bacteria to breed. I put the lid on and then loosened it just enough that when I squeezed it air could escape. 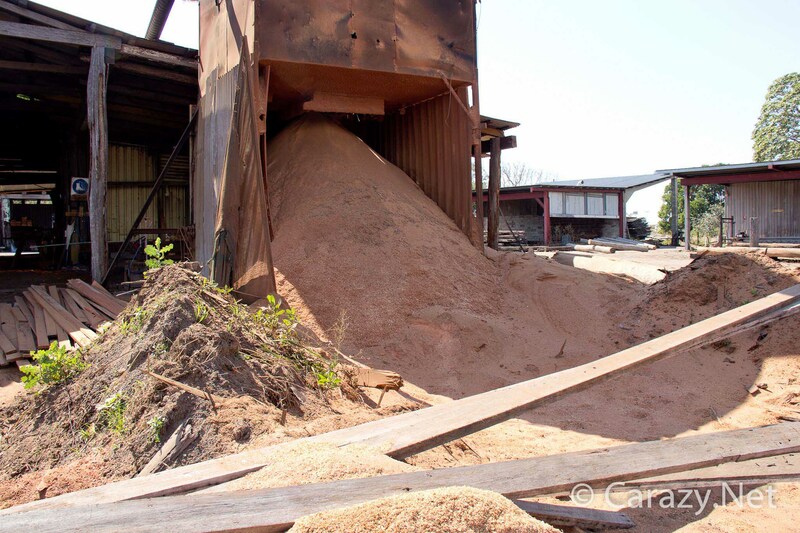 Lesson learned from exploding molasses storage container! After a week the microbes have sufficiently built up. STEP 3 : Mix the serum with your dry media of choice, basically any carbon based powder. I opted for clean hardwood sawdust because it was free and would soak up the liquid readily. Most sites say to use rice bran or wheat bran. I added the sawdust to a bucket a little at a time and used a watering can to coat it and ensure good coverage. I compacted each layer as I did it to minimise air. Note gloves and trowel to stop splinters in hand! 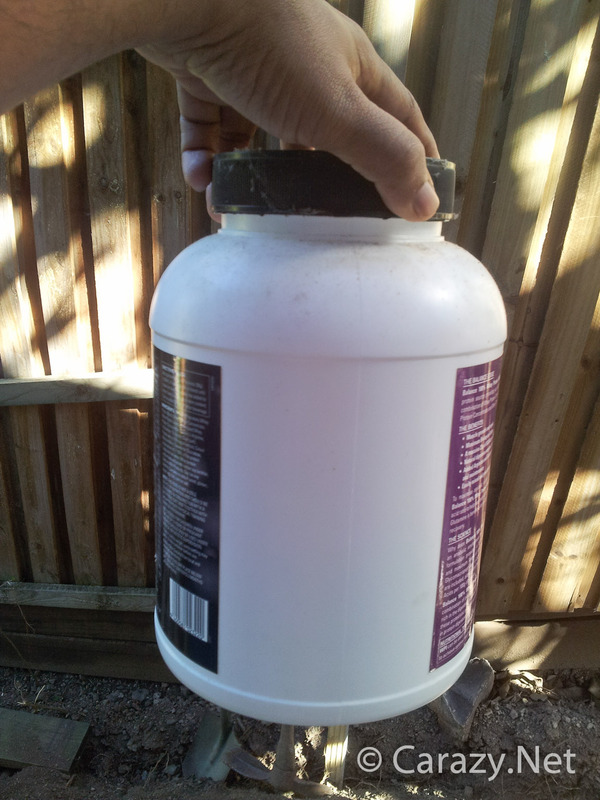 I didn’t have a lidded bucket so I used builders plastic and an occy strap to keep it airtight-ish. I’d recommend a bucket with a good lid but this worked for me for nearly a year. I kept the bucket near my behemoth wheelie bin system (LINK COMING SOON) and scooped a few handfuls in whenever I emptied my small bokashi bucket in there. Over the months the sawdust started to smell like sweet scotch whiskey. 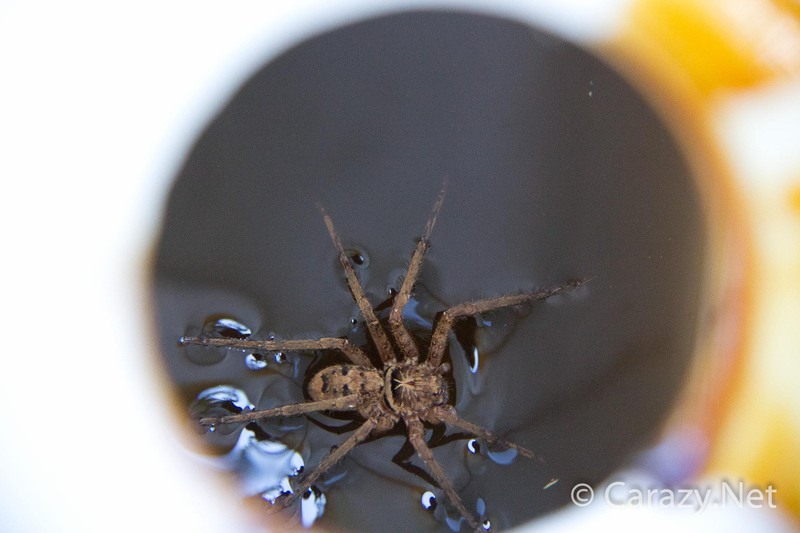 Spider that was in my watering can wondering where all this sticky fermented stuff came from. How I do it now – for the small/regular sized bokashi bin. 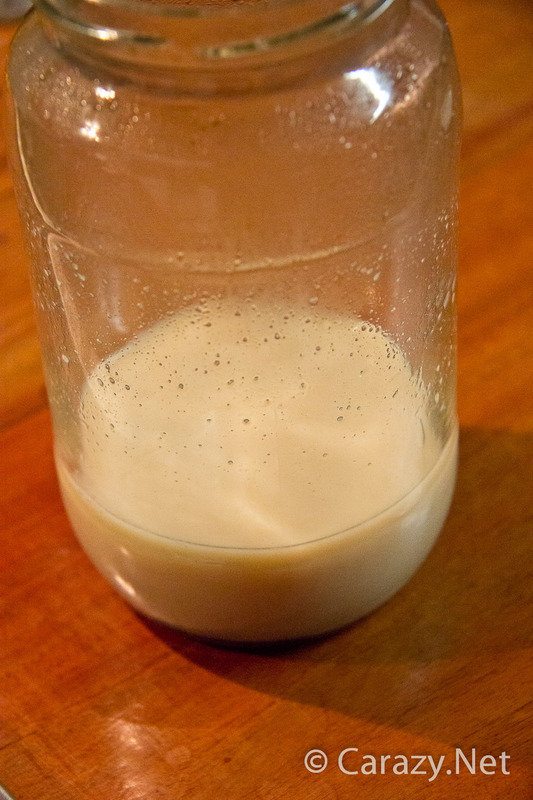 When I make my home made yoghurt (See my recipe here) I make one jar that’s super watery (I mix the milk powder at half the recommended ratio and put brown sugar in there as well). After the normal 8-12 hours set time, I leave this watery yogurt in the fridge. When I add my kitchen scraps I simply pour a small amount over the top of the vege waste or pour onto some newspaper and flip it over onto the scraps, then use the newspaper to seal it off from air just that little bit more. That’s it. There will be companies who will extoll the virtues of their secret EM bacteria. But they want to sell a product and that’s fine. But I have yet to see anyone come up with a cheaper and easier solution that the Carazy Bokashi Method. Note: I will still make the sawdust version of METHOD 2 because it is bulk, lasts for ages and is more convenient for my wheelie bin setup. People who don’t eat much yoghurt or have limited fridge space might prefer it too. 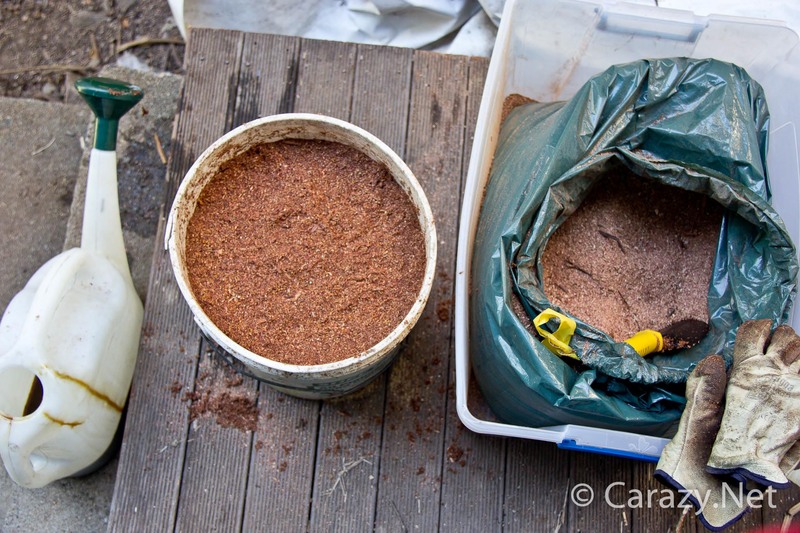 I’ve read that rice bran can be left to dry on a tarp but I haven’t bothered to try it with the sawdust but maybe it’s something you may want to try. 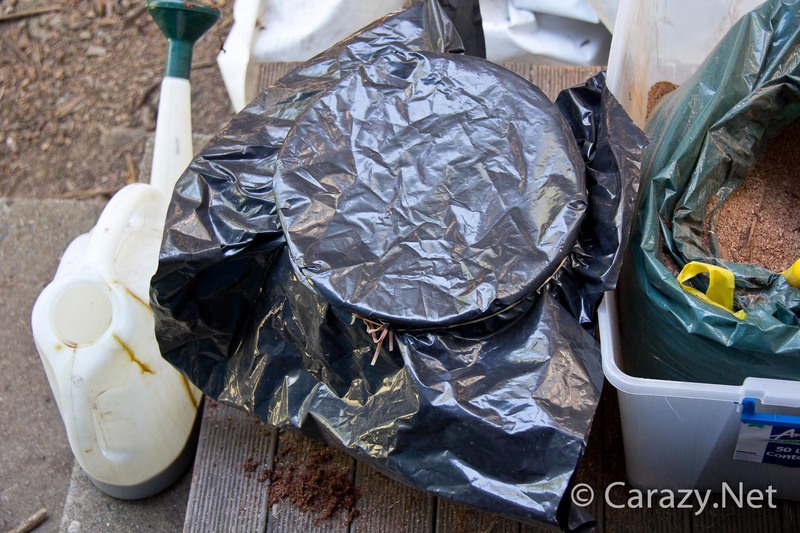 I started bokashi composting in January 2012. Its now Aug 2014 and in 2½ years I’ve never had my bins go putrid so I must be doing something right. The plants that get fed the juice are thriving and my kitchen waste is getting fed back advantageously into a food system. Not to mention the 120kg/week of food waste I was composting from a local cafe for several months, more on that in the next Bokashi update. If you liked this please share this page so others can benefit from my little experiments. If you want to keep up to date with my other projects follow my facebook page (button on the right) and/or youtube channel. Installing A Water Tank And Are Rainwater Tanks Worth It.